Presentation matters. This is why more and more countries in the WHO European Region are deciding to make plain packaging for tobacco products mandatory. 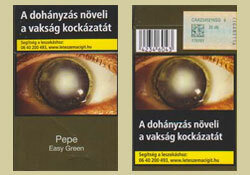 For Hungarian smokers, tobacco packages have just become less inviting. Hungary is one of the countries in the Region that decided to use plain packaging. According to the law, all cigarettes and roll-your-own tobacco must be packaged and sold in plain packages as of 20 May 2019. The first cigarettes in plain packs are already on the Hungarian market, in spite of the final deadline for implementation being 2 years from now. International evidence suggests that plain packaging reduces the appeal of tobacco products, particularly among young people, increases the effectiveness of health warnings and reduces the ability of branded tobacco packaging to mislead consumers about the harmful effects of smoking. 66% more likely to think that their cigarettes are of poorer quality. The adoption of plain packaging is recommended in the guidelines for implementation of Article 11 (Packaging and labelling of tobacco products) and Article 13 (Tobacco advertising, promotion and sponsorship) of the WHO Framework Convention on Tobacco Control (WHO FCTC). This legally binding treaty has been ratified by 181 countries globally.